(Newser) – France's interior minister says the protest violence in Paris is "under control" despite scattered tensions but is calling it "totally unacceptable." Interior Minister Christophe Castaner says 135 people were injured in the protests Saturday, including 17 police officers, the AP reports. He says "exceptional" security measures allowed police to put nearly 1,000 people in custody. 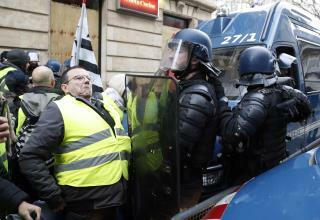 Casataner estimated there were 10,000 yellow vest protesters in Paris on Saturday, among some 125,000 protesters around the country. Protesters smashed store windows and set fires around Paris and clashed with police, who fired tear gas throughout the day in the French capital. Dozens of French riot police backed by an armored vehicle charged protesters on the Champs-Elysees, firing tear gas beneath the sparkling lights of one of the world's most elegant avenues. Demonstrators in yellow vests carried a huge banner calling for President Emmanuel Macron to resign and for France to hold an emergency election. Protesters appeared to throw flares as police responded with tear gas. The confrontation came after a day of tension across Paris on Saturday and unprecedented police efforts to prevent new violence. The yellow vest movement started as a protest over a fuel tax rise but has expanded into an amorphous protest movement that French authorities are struggling to contain. It boils down to this simple question: do humans as a species deserve to continue to survive? We shall see. If it's business as usual and nobody is willing to sacrifice, we'll get the fate we deserve. France is just the tip of the iceberg folks. The president needs to stop acting like a troll with his tweets mocking France because of the protests. Not sure if he is complicit or just incredibly stupid but his comments are playing into Putin's agenda to weaken and divide Europe. Somebody take his phone away. Oh wait, trying to curtail Trump's childish impulses is what is getting Gen. Kelly fired.